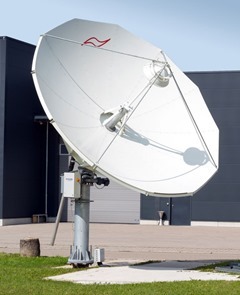 Designed for two-way VSAT communication or receive-only downlink applications, Super-HMAM accommodates satellite transmission antennas of up to 4.9 metres diameter compared with the 2.7 metre maximum antenna capacity of the standard HMAM. "We have produced the first Super-HMAM for a German government civil agency," comments Hiltron Sales Director Antonio Monteverde. "This is equipped with a 4.9 metre antenna. The actual performance achieved during factory acceptance tests in September exceeds the theoretical performance which is very gratifying for everyone involved. Needless to say, the complete structure is very large and was dismantled before being delivered for onsite installation. "Integral to Super-HMAM is a newly developed support structure which can survive the storm conditions experienced at high-altitude relay and transmission locations where wind speeds can exceed 200 kilometres per hour. All models in the HMAM range provide full motorised control of x and y axes as well as transmission beam polarity. Like the standard HMAM, Super-HMAM can be controlled remotely via an IP link from a PC running a graphic user interface. The Super-HMAM antenna control unit and associated motor-control electronics are contained in an IP65-rated weatherproof outdoor housing with a hinged front-access port secured by dual key screws. An emergency cut-off switch is easily accessible. Above the housing is a resolver which is used to measure the azimuth angle of the antenna. An identical second resolver allows constant monitoring of antenna elevation. Azimuth and elevation drive motors each operate through a reduction gear. Super-HMAM was promoted strongly during the mid September International Broadcasting Convention in Amsterdam as a new addition to the Hiltron product catalogue. Hiltron invited existing and potential customers to an inaugural Septemberfest at its stand on the Saturday evening of the show. This received good support and looks set to become an annual event.